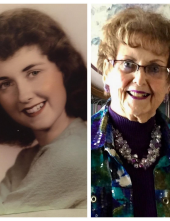 passed away at home on Thursday February 7, 2019 surrounded by her family. Bev fought a hard fought courageous battle fighting 2 terminal cancers. She was born on March 15, 1932 in Madison WI, to Ethel (George) and Lloyd Amidon. Bev married her high school sweetheart and the love of her life, Edd McCaffrey in 1952, at the United Methodist Church in Evansville WI. Together they had 4 children and were married for 63 1/2 years. Bev was a member of the Evansville Woman’s Golf Association for many years. She and Edd both worked part time at the Evansville Country Club. Edd was a bartender and Bev was one of the first waitresses and later a hostess for many years. 18 1/2 years there as a secretary. Bev along with her husband Edd, were so fortunate to have had a lake home in Boulder Junction WI for many years. They loved spending time there with their family and friends and creating lifelong memories for all. Bev loved to collect rocks, rings and dolls, but what she loved most, was working in her yard. She is survived by 3 of her children, a daughter Marcie McCaffrey, Evansville WI, a son Tom McCaffrey, Elgin Il, and a daughter Betsy (Monte) Davis, Evansville WI. 5 Grandsons and 5 Great Grandchildren. Adrian Runaas, Adam (Hope) Jocelyn and Peyton Davis, Andy (Grace) Davis, Troy (Emily) and Aubrey Davis and Travis (Jennifer) Lincoln and Archie Davis. A brother Larry (Betty) Amidon, a niece Traci (Doug) Albright and a nephew Todd (Mary) Amidon. Bev also left behind a very special lifelong friend of over 80 years, since kindergarten, Pat Lea. The bond that these 2 ladies had is hard to find anywhere. Bev was preceded in death by her parents, her husband Edd McCaffrey and an infant son David Lloyd McCaffrey, who only survived for 2 weeks. Per Bev's wishes there will be no services. Ward-Hurtley Funeral Home Evansville is assisting the family. The family of Bev wishes to thank her wonderful Oncologist Dr Alisha Weber, Madison Onocolgists and the entire staff there for their amazing care they gave our mother over the last 4 years. The doctors and nurses and the entire staff at St. Mary’s Hospital Madison WI, and Agrace Hospice, especially her wonderful nurse Elena Kornilova and Heather Johnson. The family wishes to grieve privately and in lieu of flowers, the family wishes and hopes you can just donate your blood to The American Red Cross or make a donation to Agrace Hospice. Words can not adequately express the love and admiration we had for our Mother. She was greatly loved and will forever be missed. To plant a tree in memory of Beverly June McCaffrey, please visit our Tribute Store. "Email Address" would like to share the life celebration of Beverly June McCaffrey. Click on the "link" to go to share a favorite memory or leave a condolence message for the family.